Our Price are a BARGAIN! 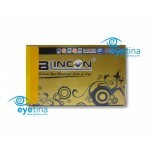 We offer the LOWEST prices for Contact Lens. We carry varieties of brands including Cibavision, Bausch & Lomb, Coopervision, Blincon, Air Optix, Acuvue, ColourVue and many more! We are an online contact lens shop with good selection of prescriptive soft lenses, monthly lenses, daily lenses, colored leness, toric lenses & multifocal lenses. We are priced low and we shipped anywhere in the world. All our contact lenses are NEW GENUINE LENSES. Rest assure as our lens are no different from the lens you would buy from your Retail Optical Shop. To top if off, we offer a 30 DAYS MONEY BACK GUARANTEES for all our orders. Please read our RETURN POLICY to learn more. We accept Payment via Credit Card/Debit Card Payment, Paypal, Bank Transfer & Direct Bank-in.